Note! this used to be a very long document, now split into three parts. The darkroom is back with a vast array of sophisticated tools and techniques to improve your images. But it is a long road towards mastering it. With the help of this chapter we hope you will get there faster. One thing is sure: ignoring it puts your photography at a disadvantage. It is important that you, the photographer, become a digital darkroom master because no-one else knows what your photos should look like. And don't be disappointed if mastering the digital darkroom may take two or more years because it remains a joy for a lifetime. Introduction to this chapter. The darkroom is back, leaving those who ignore it, at a disadvantage. The digital darkroom involves a series of conversions. First the real world is converted to film and the film to electronic image which must be immediately suitable for printing on photographic paper or by printing press. So knowledge of the various media is important. The real world is registered on a 24x36mm film, but how much of it is relevant? Resolution or picture fineness or quality is often misunderstood. The 3 bytes RGB code for colour but how is it done? How to calibrate the screen, scanner and printer?
. For suggestions, comments and corrections, please e-mail the author Floor Anthoni. In the era of the great beginning of photography, everyone used negative film to capture the right moment, but that was only the beginning of a work of art. The techniques employed in the darkroom would determine the outcome to such extent that each print was considered another original. Mastering the right choice of grade (contrastiness) of paper, dodging parts of the image and so on, were considered part of the art of photography and the results are there to witness. Then colour photography came, which was much more demanding on the darkroom, and machines eventually won the battle. Diapositive (slide) films were introduced and slide projectors sold like sliced bread. Photographers shifted their attention from the darkroom to the moment that the photo was taken. With over and under exposures, fill flash and judicious lighting, and pre-arranged moments, the editing was done inside the camera. Post production simply consisted of throwing out what did not make it. But now the digital era has arrived, even digital cameras with instantaneous results. Images can now be viewed on computer screens and powerful video projectors are gradually replacing the slide projector. Soon perhaps all photographic materials will become obsolete. But for the moment we live in the transitional period between film and digital camera. It is an era in which we can have the benefits of all existing systems, benefits which will make your images look better than ever before, but it is not easy. So why would you wish to tinker with the image you produced? Isn't it a form of cheating? emulsion scratches: caused by the camera or the processor. emulsion drop-outs: present in every film, a matter of chance. dust and hairs: some dust finds its way into the emulsion; hairs can intrude by accident. excessive graininess: certain subjects demand fast film; graininess is always an issue of compromise. unintended unsharpness: from subject motion, hand holding, wind, scanning, poor optics. poorly matched contrast: when does a photo look like the real world? colour cast and colour mismatch: colours change throughout the day and also depend on clouds, but our eyes appear to compensate for this, however the film does not. reciprocity failure: very long and very short exposures change the colours. unintended and distracting objects: the little detail that spoils the grand photo. processing stains: your unlucky day in the photo processing lab. fungus: woolly threads that destroy your image over time. specks, drops or bubbles on the lens: they can spoil an entire roll. Just imagine you had a tool that would enable you to remove all of the above while adding more quality as well? You would need less film. Your shoots would become less critical and stressful and you would be more economically secure. Well, this tool has arrived, the digital darkroom, the perfect tool to make your photos look the way they were meant to be; the opportunity to respect your own work by giving it some after care; the opportunity for amateur photographers to make more impact. additional graininess and 'noise': electrical signals produce their own random noise, dependent on colour and amount of light, and the quality of the digital camera or scanner. rastering and aliasing (repeating raster patterns): the pixel raster may interfere with the subject's raster. curves consisting of steps: pixel discontinuity particularly shows in slanting lines and curves. colours consisting of steps: in gradually blending colours, steps become visible. loss of colour: colours are bleached in the highlights and are lost in the shadows. colour mismatch: a natural colour cast or colours not perceived correctly by the medium. contrast mismatch: image looks too bleak or too peppy. blur: blur from scanning a curved film or from poor scanner optics. Blur from resampling. compression (JPEG) damage: the compression algorithm can damage. intensity banding: failures in the CCD or unevenness of pixels. colour banding: uneveness in the CCD. mistakes made in the digital darkroom: it is easy to overdo the possibilities, resulting in damage. storage and backup: suddenly your photo cabinet needs to find space on hard disk and it needs to be secured. expedition storage: no longer are photos stored on an unlimited number of films but on flash memory cards. Are you still interested? Read on and become a digital darkroom master. It adds fun to your profession or hobby and you will learn so much more about your photos. But what are the things you need and how much is all this going to cost? You need a very good scanner like a Nikon Coolscan 4ED which gives slow but accurate and low noise scans while also providing auto focusing over the entire image ($2000 but available second-hand for much less). You need a good colour printer such as an Epson Stylus Photo 1290 ($1000?). You need a good photo editing program such as Photoshop or Corel Photo Paint as part of the CorelDraw suite ($1000?). With some research you may find cheaper solutions that may suit your needs. tone refers to contrast which is also called grade. The word tone is also used to mean luminosity or the colour density, or its equivalent on a grey scale from black to white. hard and soft are identical to high and low contrast. The words peppy and dull are also used for this. colour cast is an unwanted colour intrusion over all colours. It is particularly visible in the shadows. In the chapter about lens and film, we compared the registration media of slide, negative and digital, and this we need to do in more detail here. negative film: has an enormous 'reach' or latency of up to 10 f-stops, which renders it practically insensitive to overexposure. Present-day negative films have fine grain for their speed and they reproduce colours faithfully. But it is an intermediate step and the printing stage can introduce unwanted side effects such as colour and contrast shifts. Negative film is not easily traded since it is stored in strips, but proof prints can be handled easily and they are large and convenient. Storing negatives and proof prints is efficient and compact. Now that the scanned images can be traded, the disadvantages of negative film have disappeared, leaving only its enormous benefits for the photographer. Negative film can provide 5-8 f-stops of true colour. slide film: slide film has been the preferred medium for trading since it represents the finished product. Designed for projection, slide film can be used for printing by exerting enormous care. Although the film has up to 7 f-stops density range, these represent just 5 f-stops of subject light, since contrast makes up for the other two. You must realise that slide film consists essentially of two films: a colour negative film with Red, Green and Blue (RGB) sensitive layers (which produce a CMY image) and a black and white film which cuts in at 4 f-stops, to make the shadows velvet black. Note that after reversal, a slide film contains Cyan Magenta Yellow and Black (CMYK) pigments (see below). Because at the top of the density scale the colours are truly bleached (no colour particles) and at the bottom of the scale they are mixed with black, slide film essentially has only 2-3 f-stops of true colour registration. This makes working with slides and scanning them very critical. digital cameras: For video the digital camera has evolved to perfection with three individual CCDs (Charge-Coupled Devices) for each of the main colours RGB, for the first time able to register fluorescent colours by its additive colour property. However, still cameras are still in the megapixel race with a single CCD. This makes most digital cameras very inferior to neg or slide film. They are simply unable to capture the fine colour nuances of nature. However, Nikon among others, shows that the single CCD has come a long way. Whereas neg and slide films register light in logarithmic density, the digital camera produces a linear signal. How this signal is arrived at, is a secret of the camera manufacturer. But in general it can be said that digital cameras produce soft (not contrasting) images. Some cameras produce an RGB image with high colour density precision (12 bits = 4096 steps, vs 8 bits = 256 steps) but such images can only be stored in the manufacturer's RAW format, such as Nikon's NEF format. They also use quite a lot more storage space. prints: photographic prints convert the negative image to a slide on paper. Like the slide film, they too are contrasting while having a black silver layer to create that velvet black effect. To rehearse what was discussed in the chapter on film and lens, the real life situation originates a range of 10 f-stops (1:1000) of light and it is the skill of the photographer to capture the most important 5 on film. The dotted line would produce true logarithmic registration, as our eyes would, but such images look very dull. Hence all slide films become more contrasting from the mid tones to the shades. Not shown is how this is achieved by a separate black silver layer in the emulsion. Note that in this diagram the bottom scale runs opposite to that in the tone curve tool, discussed later. Note also how our eyes (like our other senses of hearing, taste and smell) register logarithmically, which means that we perceive a factor (like an f-stop) as a linear step (like a difference). Thus the intensities of white, bright colour, full colour, dark colour and shade are perceived as equally distant, whereas in fact they are separated by factors (f-stops). This creates a problem in the scanned signal. On the computer a colour picture is represented by three bytes corresponding to the colours RGB. Each byte consists of 8 bits, together coding for 256 levels of intensity from 0 (black) to 255 (white). Together the three bytes code for 256x256x256= 16,777,216 different colours, which seems a lot but isn't. Many of the colours cannot be printed and the 256 intensity levels for each primary colour are critical. The diagram shows an image as pictured by the tone curve tool. The grey shape is the histogram, consisting of vertical bars for each of 256 densities from 0 to 255. The height of each bar counts the number of pixels for that intensity. The whole shape is scaled down to fit the rectangle. Now look at the way we perceive densities on the vertical axis, and the way f-stops are represented on the horizontal axis. 256 levels may seem a lot but they are not. The first f-stop occupies levels 255-128, totalling 127 discrete steps. The next f-stop 127-64 covering 64 steps, the next from 63-32 ranging 32 steps and the 4th f-stop has only 16 levels. It is clear that the dark colours are much less rich in variety than the light colours. In the darks the scanner experiences low light levels, adding electrical noise to the CCD signals. Thus the quantisation noise (colour steps) and the electrical noise can produce unwanted graininess in the dark colours. Note that is the other way around in neg film. Note the red curve which goes through the intersections of the linear and the logartithmic (f-stop) grids. I have named this the log-lin curve since it restores a linear signal into a logarithmic one, adapting the density more to what the eye perceives. This will be discussed further in the subchapter on scanning in part 2. Note that digital cameras may have a similar algorithm to render their images more natural looking. Note also that the loglin curve exaggerates contrast in the darks while softening the highlights. How can it be that so many of the images we are seeing in magazines are not well adapted to the way we see? How is it possible that so many don't look like the real world we live in? A typical example is the National Geographic magazine which lets us travel around the world. Yet what we see is not at all the world we live in, as their pictures are dark and colourless and often blurred and grainy. Why? This institution prides itself in its photography. It has a megastore of images carefully cellared at conditions for long safekeeping. The type of film known to last for over a century without perceptible loss in colour is Kodachrome. So all National Geographic photographers are compelled to use this film which comes in a slow but fine-grained version (25 ASA) and a faster coarse grained one (160 ASA) with also an intermediate 64 ASA. It is an excellent film for slide projection but as shown in the film comparison diagram in the film and lens chapter, is rather contrasting. To make matters worse, the photographers like to underexpose this film (to capture true colours by avoiding the bleached highlights), resulting in rather dark images with colours diluted by black. The way these images have been scanned, also leaves a lot to be desired. 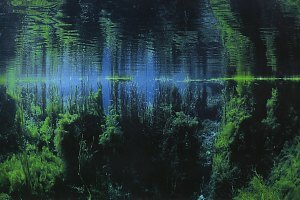 Below we have an example from one of their best underwater photographers. 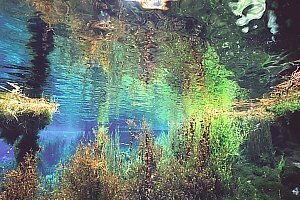 In this National Geographic image taken under water in a very clear fresh water spring, the vibrance of colours has disappeared, replaced by somber dark almost monochrome, a result of underexposure with Kodachrome film and uncorrected scanning. f027608: a similar situation recorded with negative film and scanned for optimal natural rendition. Notice the transparency and vibrance of colours, as in the real world. For more examples see /images/pupu.htm. The required image size or finenes or resolution is often poorly understood, by photographers and publishers alike. Often a 30MB file is requested for an A6 (quarter page) reproduction. Publishers and printers confuse their equipment's ultimate fineness of 600-1800lpi (lines per inch) with what the eye can perceive in a raster image in dots per inch (dpi). When printing sharp text, a high resolution is required to prevent the steps in slanting lines and curves (alias) but the human eye cannot perceive this in photographic images. I have printed many brochures with text in compressed JPEG at 200dpi (1.4MB for an A4 page stored on floppy disk!) which because anti-aliasing was used (fogging the stepped contours of the letters) looks sharp and smooth. We must not forget that the sharpest of lenses do no better than 100 lines per mm on film and that most films can only just match this. Thus the maximal resolution of a 35mm image is around 36x100= 3600 vertical lines, just visible. It can be exceeded only by having better optics, using small apertures and the finest of films and co-operative subjects of course. Alas this is not possible for most real-world situations. In order to produce 3000 'lines', one must have at least one light pixel alternated by one dark pixel in a 3000x2000 pixel image. Clearly, 3600 lines is not attainable in a 35mm original. Art magazines pride themselves in producing sharp images at 300 dpi, but much of this is negated by uncertainties in paper alignment during printing. Fortunately a small amount of misalignment produces a false sense of sharpness. Note that by far most magazines do no better than 200 dpi and that newspapers are limited to 100 dpi. To standardise our discussion on sharpness and resolution, I have produced the table below, all relating to fine art print at 300 dpi. Note that each step corresponds roughly to a factor 1.5 (in fact the square root of 2 = 1.414). By this measure, A4 quality can be attained only with willing subjects, much light and a good primary lens (not a zoom lens). Most of my own photographs do not quite make it and rate A5 instead. However where these are good A5s, I retain the larger image size. Note that most commercial scanners produce 3000x2000 pixels (Kodak) but an in-house Nikon Coolscan4ED does about 4050x2700 on a 2870 pixel CCD. Note that an A5 quality defined this way can quite happily be enlarged to A4 and even A3, as most photographs in print are not much better and the image is viewed from further away. Note also that those produced with large format cameras (45x60mm, 60x60mm) are often preferred for full page photographs. Also note that A4@200dpi is identical to A5@300dpi. Note that we've used dots per inch (dpi) here instead of the more correct pixels per inch (ppi). All above values at art quality 300 dpi; normal magazine print quality is 200 dpi. Normal scanner resolution for 35mm is 3000x2000 pix. High res 4200x2800 pix. * compressed further, visually acceptable as slide show or for comping. If an alien were to compare our pictures with the world he saw, he would have fits of laughter about our naive ways of perception. The colour of a pixel of a yellow rose does not consist just of a yellow spectral line but of a whole emission spectrum ranging from infrared to ultraviolet. What our eyes perceive is but a grotesque caricature of this rich spectrum, but even so it is an incredible feat of evolution that we have evolved the sensitivity to three primary colours that together give a fair idea of the colour of things. In other words, colour photography is a coarse caricature of the real world, adapted to the way humans perceive colour in three separate colour receptors for Red Green and Blue. The nerve signals produced by these receptors are added together to a single colour for each pixel on our retina. Amazingly, left and right eyes produce almost identical results which are correlated in the brain's perception centre. 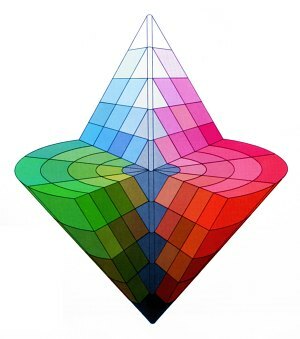 Not surprisingly, RGB are the main colours in a TV set, a TV camera, slide and print film. But colour vision is even more amazing considering that the spectra of the cone cells in our retinas overlap so much. This diagram shows the lay of the visible colour spectrum bordered by invisible ultraviolet on the short wavelengths, and infra-red in the long wavelengths measured in nanometres (nm). The three curves represent the absorption curves for the three pigments in the cone cells sensitive to blue, green and red. Note how the red and the green cone cells overlap, red colour perception being located far away from the actual red we perceive. How the wiring inside our eyes and the optical cortex works precisely, is not known but experiments have shown that three primary colours of blue, green and red located at 470, 532 and 617 nanometres, produce all the colours we are able to see. These also correspond to the emission spectra of phosphorescence used in TVs. Note that our eye's red cone cells peak again past the blue, allowing us to see purple (not shown in the diagram). Thus in theory the three components RGB work entirely independent from one another. 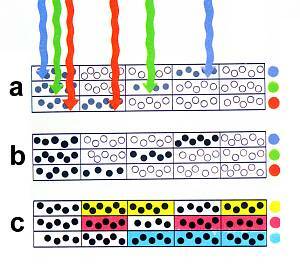 Because of this, we can draw a cube (colour space) representing all colours that can be composed from RGB. The origin of this cube is black (K), and its axes are R G and B. 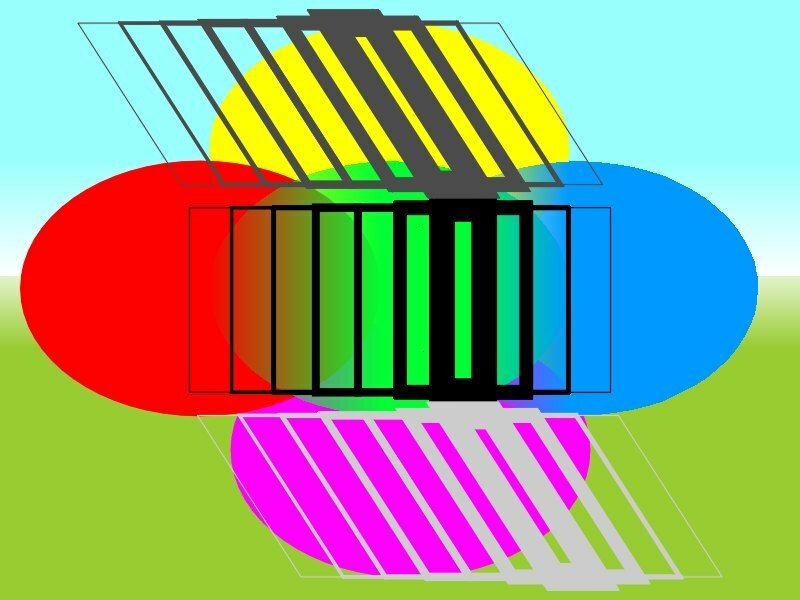 Thus R G and B make three of the corners of the cube; black and white two other; the remaining three are the secondary colours Cyan, Magenta and Yellow. These are the primary colours in printing, which is done in the CMY colour space represented by the red triangle. 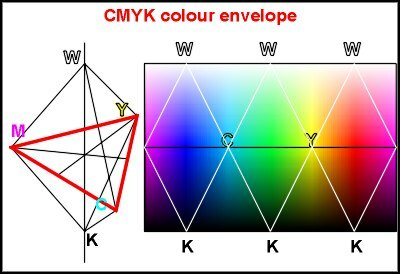 By adding black (K) and printing on white paper (W), this colour space is essentially the six-sided five-cornered hexahedron CMYKW, referred to as the CMYK colour space. The colours in the space between the cube and the smaller hexahedron can thus not be printed, which includes pure blue, red and green and the fluorescent colours. Note that the distance from the origin to any colour inside the cube is the Lightness or Luminosity of that colour. This diagram shows the CMYKW hexahedron (two triangular pyramids together) and the red base triangle. Mixing C, M and Y reaches any colour inside the triangle but not outside in the same plane and not above or below it. But they still make the colours of the rainbow, although the primary colours R G and B are not so bright. The colour palette on the right shows the colours as if the sides of the hexahedron were folded open. Below the equator, colours mix with black, becoming darker, as above they mix with white, becoming lighter. Not shown are the colours of the inside of the hexahedron, which are the browns, greys, olives and so on. The space inside the cube contains the gamut of colours (the whole range) we can see. But the gamut for what can be printed is much less, inside the hexahedron. Hence the sRGB standard stays within the gamut of what can be printed, or the range of subtractive colours. Your photo editing program provides an option to test whether the colours of your final product lie within the printable gamut (gamut test). Those colours that don't will be truncated or limited, which should be avoided. The CMY dyes used for printing do not let a small part of the spectrum through but a wide part, and they overlap in such ways that graduations between combinations define new colours the way we see them. Unfortunately, this ideal cannot entirely be achieved, resulting in a different colour rendition depending on the manufacturer of the dye. The diagram shows the principle of subtractive colour mixing as it happens on photographic negatives, slides and in colour printing. The top three rows show the simplified spectral ranges of each of the C M and Y dyes. Note that each lets two primary colours through. Mixing Cyan and Yellow blocks red and blue while letting Green through. Likewise Cyan mixed with Magenta, lets Blue through and Yellow mixed with Magenta produces Red. The look of colour images depends on whether the dyes used are transparent or opaque. Inks are transparent, letting the white of the paper shine through. Photographic dyes are also transparent and the brilliance of the print often depends on the reflectance or pearliness of the photographic paper. Note that the light of ink and photographic prints pass twice through the colour dyes: once on the way in and again on the way out. In this manner a thin colour layer produces deep colours. When printing overhead transparencies on ink jet printers, the difference can clearly be seen. It takes some practice and experience to get the right amount of ink on such transparencies. Oils such as used in painting and printing, are not transparent, and neither are powders used in colour copiers. The artistic oil painter uses white paint and bright oils to bring light in his paintings. The colour printer uses the technique of rastering, which applies a precise quantity of paint while also leaving a precise quantity of white paper unpainted. When applied very lightly, printing inks have some degree of transparency. The LCH colour space (Luminosity, Chromaticity, Hue) is shown here. At its equator one finds the hue or colour wheel or rainbow, going fully 360 degrees around. In this manner each primary colour is located opposite its complementary colour. But remember that the visible light spectrum does not form a closed circle. The vertical axis is Luminosity or lightness and the radius represents colour density or chroma. One finds the grey scale right through its middle from white on top to black on the bottom. Inside the peel of bright colours, one finds the more subdued ones, including the browns and olives. Note that the colours in this drawing are not quite right. do slides produce additive colours? There exists confusion about which media produce additive colours, thus the complete range of colours. Let's examine this further by looking at a colour TV screen. It is made up of groups of three dots (or similar shapes) for the colours Red, Green and Blue. Three electron beams inside the tube are aimed precisely at each dot through a variety of patented systems. In this manner each colour dot behaves as if it were an independent little light source. Being too fine for our eyes, we see each group of RGB dots as a single colour pixel. The colour picture shown here was made by shining three spotlights in the colours RGB on white paper. 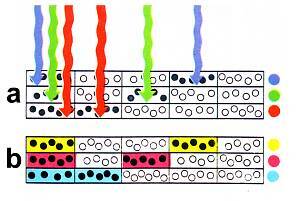 Where the spots overlap, the secondary colours CMY are formed by addition and in the middle white. Look at the whole pattern from a long distance and you see only a white patch as all colours merge in the bizarre neural network of our retina. Modern LCD computer screens likewise have precisely placed RGB dots, each masked by a Liquid Crystal Display element. The whole is back-lit by neutral white light. 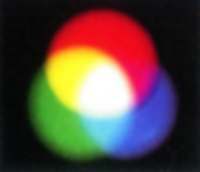 Thus the intensity of each colour in each pixel can be controlled with precision, much like a standard colour TV. Thus LCD screens, even though they hold back light, produce additive colours. In LCD projectors, the white light beam is split into three parts, each filtered for the primary colours RGB. Each has an LCD matrix which controls the intensity of each pixel. Then the three light beams are precisely brought together again and their light merges additively. A negative film has three layers sensitive to RGB (a) but during development the dyes for the complementary colours CMY are coupled to these silver halides (b). A negative image results. When printing this image on photographic prints, the same process inverts the image again, resulting in a positive image. A slide film also has three layers sensitive to the primary colours RGB. This layer is first developed, resulting in a grey scale image (a,b). A reversal is induced with light or chemical reactions, activating the unexposed components and coupling CMY dyes to these (c). The resulting combinations of CMY in these layers produce a positive image once the exposed silver halides have been removed. Thus a slide film ends up consisting of subtractive colours CMY. This diagram shows how light travels in a photographic print and how it traverses the dyes twice, which doubles colour contrast and intensity. Blue travels through Cyan + Magenta; green through Cyan + Yellow and red through Magenta + Yellow. Where the three CMY occur, the light is blocked entirely. Likewise, where no dye is located, all light components bounce back from the pearly base. The colour profile most used is sRGB (scanner or subtractive RGB) which makes the best use of the RGB colour space for prints and photos. It makes worldwide exchange of colour images possible. Note that sRGB is not the same as video RGB which is additive RGB and is richer in colours that cannot be reproduced in print. For your digital darkroom you first need to set the computer monitor characteristics to sRGB. In Windows, right-click (menu-click) on the desktop. Select properties then the settings tab. Select high colour 16 million colours or better and the required screen resolution (say 800x600). Click Advanced, then the Colour management tab and set it to sRGB colour management. Close all windows. Do similarly for your printer and scanner (see your printer and scanner instructions). Use the grey scale checkerboard test pattern to calibrate your printer. This image has been saved in paletted GIF (Graphic Internet File) format. Open it in your photo editor and convert it to RGB (not really necessary). Print it on your printer as if it were a colour image to see where a colour cast comes in. If possible, disable the black ink. But if you want to use it as a colour test image for your camera, print it in greyscale by disabling the colour inks. Disable the print profile of the editing software and use the printer's sRGB profile instead. Study the result for colour cast in the black and white and adjust the individual colour settings for CMY until the checkerboard looks like a black and white photo. Save the obtained printer profile for later use. Adjust your screen colours if a colour cast is visible. In your photo editing software, open a good colourful photo and print it. Disable the print profile of the editing software but use the printer's sRGB profile instead. Adjust your screen contrast and intensity to make it look like the printed photo. Take your file to a commercial printer to print a Xerox colour copy or/and a digital photographic print. Compare all results. They should be uncannily equal, such is the rigour of the sRGB standard. Only by doing this will you be sure that your work will reproduce elsewhere as intended. Don't be disappointed if this takes a week to achieve. Tip: you could use the practice image shown further on. LCH: Luminosity (Lightness) + Chromaticity (intensity) + Hue (colour type). Hue is represented as the colours of the rainbow, chromaticity the amount of colour and lightness the total lightness of the colour. Lab: Luminosity + component a + component b. Is almost identical to LCH. YCC: is almost identical to LCH. It is a colour scheme used in Kodak Photo CDs and results in a more compact representation of the picture. JPEG: is a compressed filing scheme that compresses RGB files by converting to a YCC colour profile and then compacting it further. There are two versions: YCC=4,2,2 which is the most compact and common, and YCC=4,4,4 which is more suitable for your originals and archive. What this means is that the algorithm gives more or less space to colour precision. Note that the 4,4,4 colour scheme can often not be displayed by DVD players. TIFF files do not compact very well; they do not have a JPEG scheme. With 4 bytes per pixel these files stay rather large and are unsuitable for sending by Internet. CMYK is not a rigorously defined colour scheme like sRGB, and depends largely on the types of ink used for printing. So each printer has a different CMYK colour profile. Conversion from sRGB to the CMYK of choice is accurate and painless and can be done by the printer.